As the oldest daughter of Joel Fuhrman, MD, bestselling author of Eat to Live and Super Immunity , Talia Fuhrman knows that the true meaning of health and wellness comes not only from delicious, nutrientrich foods, but also from the power of positive energy and zest for a truly fulfilling life. 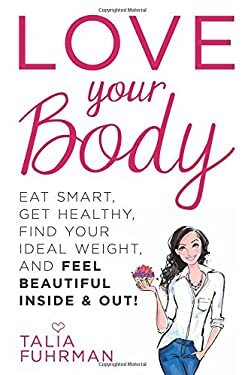 In Love Your Body , Talia Fuhrman shows readers how to get their green juice on, find their ideal weight, and get radiant, clear skin'e"and also how to gain confidence, enjoy strong friendships, and explore the passions that make them jump out of bed each morning with their widest smiles. Motivated by her own struggles, and those of her friends'e"weight gain, skin troubles, stomach aches, frequent sickness, migraines'e"Talia knows that eating a plant-based diet packed with all-natural, nutrient-rich ingredients makes body issues a thing of the past. With a fresh, engaging voice, Talia inspires readers to nourish their mental and emotional health, too. She places a strong emphasis on inner beauty, and offers advice on how to maximize their social lives, and care about the worldaround them. With nutrition tips, actionable advice, and delicious recipes, this mind-body manual offers a fun, simple roadmap to a vegan lifestyle, and proves that loving your body'e"inside and out'e"can be positively delicious!